Yellow Day is a “new tradition” to celebrate the coming of summer. 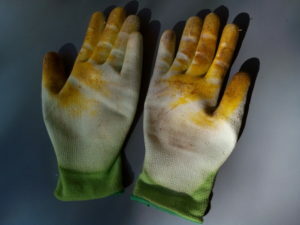 Join a hands-on workshop to dye your clothes using the brilliant yellow of the dandelion flower. Participants are invited to bring along a light-coloured or white item of clothing – a shirt, blouse or T-shirt made of cotton, linen, wool or other natural fibre – then over-dye it using fresh dandelions collected in South Tyrol. Sunday, 14th April 2019. Start 10.00am, finish 15.00. Sockerhof, Mals. See Hier und da festival programme here. N.B. Limited to 20 participants. Email> info@muu-baa.org to secure a place. See instructions below for preparing your item of clothing. Select a light-/pastel coloured or white item of clothing made from cotton, linen, wool or other natural fibre. Weigh your clothing to find the dry weight in grammes; write down the weight as we shall use this to calculate additives during the dyeing process. Items must weigh less than 250g weight e.g. a shirt, blouse,T-shirt or light summer pullover or lightweight trousers. Once you have selected your item you need to scour it. Scouring removes greases, waxes and other substances preventing the dye to attach to the fibres. You can scour with ordinary baking power (bicarbonate of soda) by adding 2 teaspoons per 4.5 litres of water. Dissolve the powder, then bring to simmer (just below boiling) add your previously wetted clothing. Keep on heat for 45 minutes. Let cool until you can take it out and rinse in clean water. Dry and bring along your “scoured” item of clothing to the workshop. We will provide the mordant and dye baths. 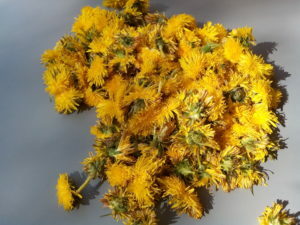 If you have time to collect some dandelion flowers, please do. Bring along 250-500g of flowers. This will help us replenish the dye baths. Thank you.